Aha, just noticed that WattmOn is out. Awesome for the Windows guys. edit: looks like wattmon edits clocks only on first card?? The voltage is still on auto and i need to go in wattman to set it on manual and then respects my values. If the amd settings/wattman is not installed it doesnt respect the values and voltage is on auto. I had issues with modifying system files error. Thats way too much power. My own settings are 29.2mh per card and 115w on the wall. 4 cards = 115*4+50=510w. I have 4 mh less total against 4 cards with your settings and over 200w less which cost way more then these 4mh make per month on my 10c per Kw price. My cards run on 65-68c on 60%/2350rpm fan. Yes I also agree thats way to much power. 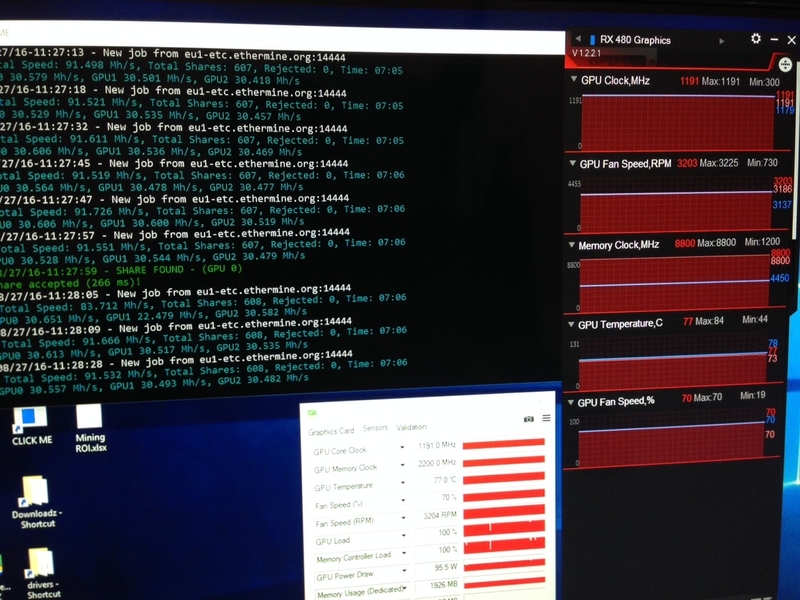 Yesterday I tuned my 480 with boysies mod (basically the same) and I get 30.4mh @ 82W in GPU Z that is around 110W on the wall. its not, 75w is 115w on the wall. At least on my CM v1000 psu. I checked with my new clamp meter and it measures 4.4A and 3.5A @12.2V makes 96W for the 470. It shows 76W in gpu z. So yes 82W in gpu z is more around 118W on the wall. Agreed but it depends on the efficiency of your psu. For my 90% eff psu, the calculation is the above. Success on Windows 7 Pro... for the most part..
1. Start off in Windows with Stock BIOS, Stock Settings, no undervolt/overclock. 2. Reboot to safe mode and run DDU to safely remove all video drivers. 4. Install drivers and reboot. 5. Once Windows comes back up you should have all your cards seen in Device Manager and all should be good. If you have more than 4 cards you might have to run the 6GPU fix to get the other working. Don't move on to the next step until you've got all working in Device Manager. NOTE: Sometimes it's a good idea to flash 1 card at a time. If you want to do this, shutdown your rig, unplug all RX 480s except 1 and boot back up, repeating the below process to flash eash GPU. 7. Open a command line, as administrator, and browse to the Atiflash folder. Type atiflash -i to list the GPU or GPUs you have connected. Once the first one will be "0", then 1,2 and so on if you have more than 1 connected. 8. If you are comfortable with the GPUs that are connected, you can now flash the BIOS by typing "atiflash -f -p 0 BIOS.rom" without the quotes, where "0" is the number of the GPU you want to flash and "BIOS.rom" is the name of the ROM you want to flash to the card. It will give you some info on what it is doing and then take a minute or 2 to flash. When it is done, it will prompt you to reboot to make the changes take effect. You can proceed with flashing the other cards before rebooting, or at least that worked for me. 10. Download the Driver Signature Enforement Overrider software (http://www.ngohq.com/?page=dseo) Again, do at your own risk. This is the only way I got it to work in Windows 7 though. 11. Download a copy of the atikmdag.sys file from the link provided in this thread. Save it to your desktop or folder you can remember. 12. Open the Driver Signature Enforement Overrider software and it will ask you what you want to do. Click "Enable Test Mode" and click Next. It will prompt you to reboot, so go ahead and reboot. 14. Enter the file path and hit next, then reboot. 15. Move the atikmdag.sys file to the c:\windows\system32\drivers folder, overriding the one in place and reboot. When your computer comes back up, you should (hopefully) be good to go with the new atikmdag.sys file and flashed GPUs. Again, this is a rough outline of what I did. If you have any questions, don't hesitate to ask. Hopefully I can help! I tried this on win 8.1 different times, cant get it to work? help anyone, driver is not properly signed i guess..
tem como passar o consumo detalhado e quantos % fez de oc ? Well got it running after the last cards arrived this morning. 1090 Watt @Wall whole system: X58a-ud5, X5650, 6 reference RX 480. Thanks to Heliox, boysie and all the others who gave valuable input! Right now 1mh = 2usd per month and 50w cost 3.6usd per month on 10c price per kw. So better drop 2mh per card and 50w per card you will have nice quiet rig making the same amout of money. oh man I tried to edit polaris myself and must have changed the max% wattage too much. Now the computer will not light up in the slightest when I have even a single card plugged in, yet Im able to boot it using a backup card or integrated. I have a good feeling I just fucked my cards up. rookie stuff. @zorvalth , thats the plan thanks . Now running with 175Mh/s and 975 Watt @ Wall. 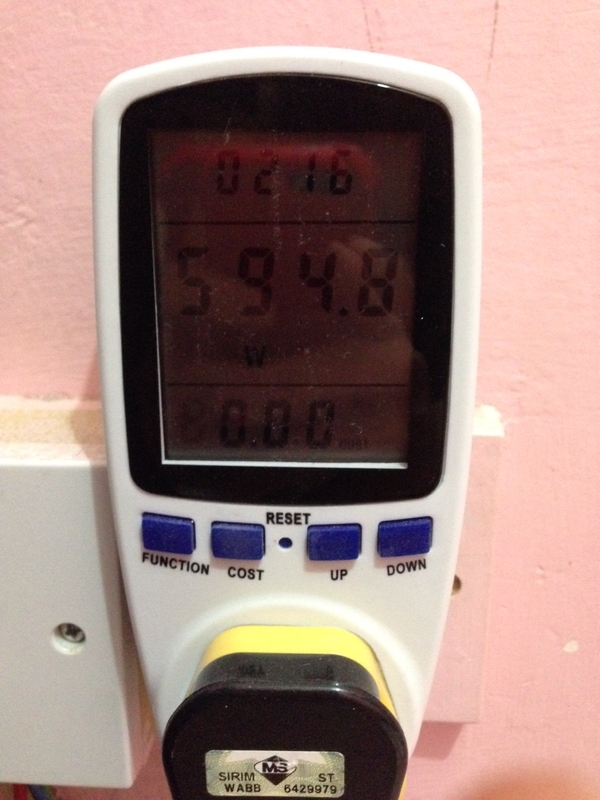 Btw electricity cost here is ~ 26c . This rig ist more hobby than solid miningopperation. i have managed to get this to work in win7 using low power rom. It's been stable for 2 days now, each card hashing at 29,3Mh/s. I would like to try high performance. Do I need to flash cards again with high performace rom or can I just change settings in wattman on this low power rom, like bump up mem clock, core clock, power limit, to get like 30, 31Mh/s ? It's the 31,25 Bios with [email protected] and -10% PT. Will test these settings for a few days an then tweak ist further when Wattmon works with more than one card. 29.3mh on 1100/2100 clocks and 920/900 voltages, using 1625 mhz strap timings copied on 2000, it gives 115w per card on the wall and 720-750 total of 6 cards. 200w saved on 10c per kw/h = 14-15usd, on 20c, = 30usd. 6*1.5mh lost = 10mh lost = 20usd per month less. so on 10c kw/h you are loosing 5usd but having 65 celaseus cards on 60%(2350rpm) fans. if electricity cost = 20c you are making 10usd more despite lower hash. gpu-z shows 75w, on the wall i measured 115. Thanks guys, flashed a Sapphire and a XFX and it works So just let it work from now! @cidmo which Rom give you 28mh/s with 100w @ wall? ?